A program aimed at improving the restoration and management of Great Lakes fish communities is coming to Indiana this spring. The Great Lakes Mass Marking Program will kick into full swing in mid-March when the Indiana Department of Natural Resources marks nearly 225,000 small chinook salmon scheduled for spring stocking in Lake Michigan. The 2011 marking effort is focusing on chinook salmon to assess natural reproduction levels and provide fishery managers detailed data on survival parameters of each agency's stockings. Coded wire tag-mass marking technology has been used effectively in the Pacific Northwest and parts of the Great Lakes for many years, but federal funding has allowed for a basin-wide effort with all federal, state and tribal fish hatcheries participating. 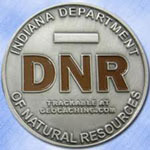 "The mass marking program is very important, and Indiana is committed to use this technology to learn more about where Indiana's fish are caught and to compare survival from our three stocking sites," said Brian Breidert, a DNR fisheries research biologist. "In addition to a fin clip, each fish will receive a micro-tag specifically coded to a stocking location. "Current estimates indicate over 50 percent of the chinook salmon in Lake Michigan are wild fish, and use of mass marking will refine that estimate and lead to a better understanding of chinook population trends." The hatchery-raised chinook will be about 3 inches long when tagged and close to 4 inches long when they are released in March. Biologists will use a specially designed trailer to count, measure, remove the adipose fin, and inject each fish's snout with a small coded wire. These tags cannot be seen with the naked eye but the clipped adipose fin will tell biologists and anglers that a tag is present, indicating a hatchery stocked fish. Beginning in 2012, biologists will collect information and chinook salmon heads during creel surveys and fishing tournaments. They will focus on fish with the missing adipose fin. Trout and other salmon species will be tagged in future years so biologists will have the ability to answer questions regarding those species as well.